Is your rug dirty or stained and needs cleaning? In this post, you can find out how to clean a rug at home without spending hundreds of dollars getting it done by professionals. You will also find tips on how to maintain it as clean as possible for a long time. 2 How to get rid of certain types of stains from your rug? 3 How to clean wool rugs at home? 4 How to clean a cotton rug in your home? 5 How to clean jute rugs at home? 6 How to clean a synthetic rug at home? The first thing is pretty apparent. Take out your vacuum cleaner and run over the area rug a couple of times from both sides. It will help remove the odors. It may look obvious step, but you can be surprised what comes out by just doing this. Before vacuuming, you can sprinkle some soda over the rug. Use the brush attachment to take out the hairs that are stuck on the carpet. If you have pets like me, you should use a carpet rake. It will make your job much more comfortable to remove those stubborn hairs from the rug. You can check the current price on Amazon of the one I use at my home. It takes out both synthetic and natural hairs. The last thing you can do is take out the rug and use some good old beating. It will help you remove the dust as well as some stress you might have. Please remember to use a mask to prevent breathing in the soil that comes off. How to get rid of certain types of stains from your rug? Oil, far or wax: Use a paper towel to blot the stain. Do it until you can’t see any oil on the paper towel. Make sure that you are are not brushing it. Otherwise, you can spread the stain on a bigger surface. Mix one quart of water with one-fourth teaspoon of dishwashing detergent. Avoid cheap soaps that contain bleachers. Apply the mixture on the affected area with a sponge. Blot until the stain until you obliterate it. Gum: Put a bag of ice over the chewing gum and wait until it hardens. Then scrape as much as you can with a scraping tool. If this doesn’t help you can always try special cleaning fluids such as 409. Coffee or Tea: Use the mixture of one quart of water with one-fourth teaspoon of dishwashing detergent and blot the stain. Again if this doesn’t help use 409 fluid. Nail polish: Blot the stain with a towel dipped in nail polish remover. Tomato sauce: Use a paper towel to blot out the stain. Repeat until all the liquid is absorbed. Make a mixture of 2 cups cold water and one tablespoon of dishwashing detergent. Blot the affected area with a sponge soaked in this mixture. Rinse the stain with 2 cups of cold water and one cup white vinegar. Damp the stained area with a clean towel to dry it. Glue: Moisten a clean towel with rubbing alcohol and press it on the affected area. After the glue stain gets well moistened, carefully wipe off the stained area. Repeat this until you remove all the visible glue from the fabric. If this doesn’t help try putting a clean towel over the stain. Use your iron and run over the sheet. Once the glue turns into a liquid, it will get absorbed by the towel. Vine: Blot the liquid with a clean towel until it is absorbed. Then pour some cold water on the affected area and blot again. Do this a couple of times to remove as much as you can. After you’ve done this, make a mixture of baking soda and cold water (3:1 ratio) and put it on the stained area. Once the rug dries, vacuum it. Urine: Blot the wet area with a clean towel. Mix one-quarter teaspoon of liquid dishwashing detergent with one cup of warm water. Avoid cheap soaps that contain bleachers. Apply the mixture on the affected area with a sponge. Rinse with warm water and try it with a clean towel. How to clean wool rugs at home? Wool rugs are well known for their durability and tendency to keep color longer than other types of rugs. But on the other hand, they tend to hold more dirt and dust in comparison to others. First, take out the rug and shake it a few times. Then use the rug beater to remove all the dirt and dust particles. 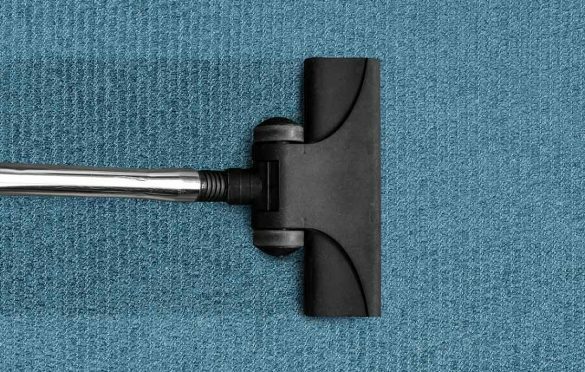 Vacuum the rug to ensure you removed all dirt residue. Make a mixture of cold water and laundry detergent in a bucket. Moisturize the microfiber towel in the bucket and dab the rug. Be careful; you don’t want to make the area rug too wet, because it tends to retain moisture. Moisten a fresh microfiber towel in clean cold water and blot the rug. Now blot the rug with regular clean (possibly white) towels. Let the rug outside till its completely dry before walking over it. How to clean a cotton rug in your home? Some people prefer cotton area rugs due to their lightweight. They are indeed lighter than wool rugs. But the ability to hold on to dirt is no different than the wool ones. If you have a smaller rug, you can give it a good shake or beating with a rug beater and then put it in the washing machine. Since cotton rugs are lighter and do not absorb a lot of water, it won’t be a problem for the washing machine. Just remember to set the washer to a delicate cycle and cold water. After you’ve washed it, dry it thoroughly before putting it back. In case you have a bigger rug, and it doesn’t fit into the washer you can use the steps I described in the paragraph about wool rugs above. How to clean jute rugs at home? The one thing that you must understand about jute rugs is that moisture is their enemy number one. To clean a particular area, you must use a special dry cleaning kit. You can check the one I use on Amazon. First, take out the area rug and shake it a few times. Then use the rug beater to remove all the dirt and dust particles. Sprinkle the dry cleaning powder from the kit onto the rug. Using a brush, gently clean the rug. Don’t scrub too heavy or you’ll damage the material. Vacuum the rug to ensure you removed all the dry cleaning powder. How to clean a synthetic rug at home? First, you must check the material from which the rug is made. It can contain different materials such as nylon, olefin, polypropylene, and rayon. Check out the care tag attached on the back side of the rug to see what elements or fabric you are dealing with and see if you should avoid some cleaners. Spray the rug with the water hose to ensure it is evenly wet. Apply dishwashing detergent over the rug. Use a bristle brush (Amazon link) and gently rub the rug. Rinse the rug with the water hose until it is no longer soapy. Leave the rug to dry out before placing it back entirely. You should consider rotating it from time to time, to dry faster. Important: No matter which material your rug is, always follow manufacturer cleaning instructions if they are available. You can find it on the back of the area rug. Also if you are using specific cleaning products make sure that you read the instructions on the product as well. You can also test a tiny area to see if it works and doesn’t damage the rug. Also read: How to get rid of birds pooping on your patio. Vacuum the rugs regularly. Do it at least once a week. If dirt remains on the fabric for a more extended period, it can cause damage. If you have little kids or pets, as I do, you should consider getting a good carpet steam cleaner. It will make your life much more straightforward. I use the Hoover Power Scrub Deluxe Carpet Washer FH50150. You can read my review on Hoover Power Scrub Deluxe here. It is the most selling steam cleaner on Amazon, and for me it does wonders. But feel free to check the others as well. From time to time when vacuuming, sprinkle some baking soda over the rugs. I will help reduce any odors and keep the carpet smelling fresh. Treat stains as soon as they happen. The faster you tackle them, the easier it will be to clean. If you have additional questions on rug cleaning and maintenance, or you only want to share a tip, you can use the comment section below. I just got an older rug from my grandmother. I want to get it really well cleaned before I put it in my living room. It is good to know that I should start by vacuuming it. Personally, I would rather have a professional service clean it up for me. Wow this is a great article. I agree that the very first step is to identify the type of rug and you covered this really well. Thanks for the tips! Oriental rugs add a unique appeal to the home, but they require their own special maintenance. Thanks for sharing such an informative article! Good information. well, mostly peoples not search these types of the topic because of women mostly serve their lots of time to manage home cleaning. well, thanks again and keep updates news post related to this topic.